The glitter of metal has been a real hit in the 70s. Everyone was disco-dancing to ABBA’s hit “Dancing Queen” and clothes had to be colorful and metallic to shine under the disco lights. With the sudden decline of disco sometime in late 1979, however, flamboyant metallic clothes became outmoded. 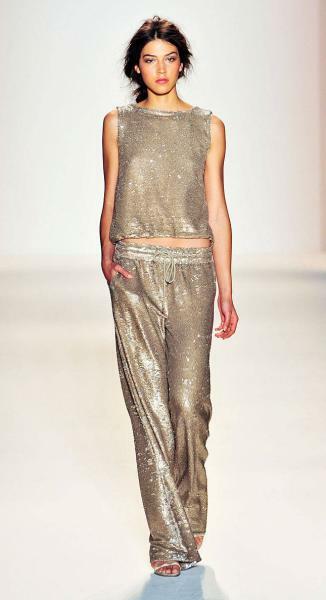 Since then, metallics have reappeared at catwalks a couple of times. 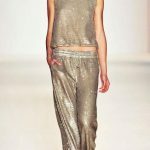 In 2000, silver but especially gold, were a must-have on catwalks of famous designers and in spring/summer 2009 shimmering shades of gold and bronzes decorated many fashion shows. In 2013, metallics made another comeback. It started off in spring/summer and went all the way to fall/winter collections. Metallic color turned every piece into a dazzling style statement. Silver and gold proved to be a big hit on the red carpet in early 2014; Naomi Watts, Kate Beckinsale and Olivia Wilde were only a few of the many celebrities that chose metallics for the Golden Globe Awards ceremony. Designers constantly experiment with this trend, and in the collections of spring/summer 2014, metal secured the position of a hot trend, again! Even though, too much shine can become a bit “tacky and kitsch”, designers mastered the art of “disco shimmer” and created elegance and style. Precious metals like silver, platinum and gold blend together with lurex or lamé hues of emerald, red and blue; the choices are endless. Tom Ford created the mosaic disco dress to show his preference towards this trend and so has Versace, who blended silver with all-time-classic black to create shimmering evening dresses. Gucci and Lanvin played with colors and created futuristic iridescents that will make this summer’s nights extra playful. Proenza Schouler, the fashion label which presented one of the most wearable versions of the controversial feathers trend in their autumn/winter 2013/2014 collection, proved the most reserved of all. 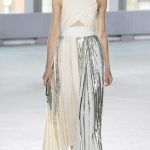 Lazaro Hernandez and Jack McCollough, the Proenza Schouler designers, are aware that an all-metallic look can be very difficult to pull through, especially during the day. Therefore, they bonded pleats with razor-thin stripes of silver and bronze to create skirts and dresses that are easy-to-wear all day. Can casual sportswear benefit from this trend? Rachel Zoe certainly thinks so, with her metallic tracksuit-look-alike, and so does Marc Jacobs. 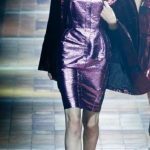 In his Marc by Marc Jacobs spring/summer 2014 collection, there was a big emphasis on metallic shine with his models wearing metallic trainers with everything. metallics reflect light. If worn close to the face, in a blouse or dress, they can enhance any facial imperfections. If you need to take attention away from your face, wear either a skirt or pair of trousers or, chose clothes with metallic details only. pick only one metallic piece to wear and not a mixture. 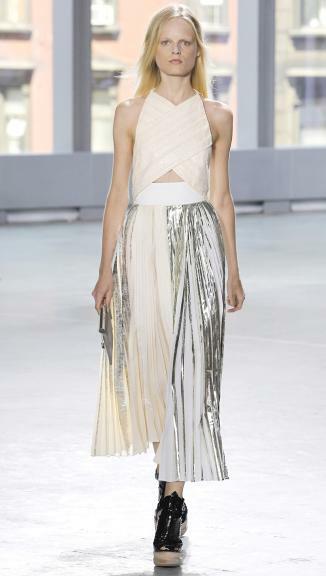 Choose a metallic skirt, or dress only and keep the rest of your outfit simple and minimal. Do not go for an all-metallic look with shiny shoes and all; it is too risky and there is a big chance you will end up looking like a disco ball. do not overdo it with make up. You can have your favorite smokey eye look but always try to keep the balance between colors. try to keep accessories to the minimal, since metallics offer a significant shine on their own. It’s time to shine with glamour and style this time around, ladies!